Like all good stories, musician Ruby Allmond’s career had three distinct parts. First was the struggle to gain recognition as a performer, then came three decades as a songwriter, with several Nashville hits, including one top-ten single. No less satisfying was the final phase of defining a legacy. Ruby was born on a farm in southeast Fannin County, near the Bailey community. 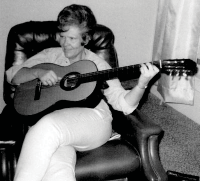 As the “last of the litter” in a musical family (one sister, two brothers), she learned to play the guitar while sitting on her daddy’s lap. Other family members played the fiddle, banjo and mandolin. At the age of four she performed at a nearby school, earning praise that assured her lifelong passion for music. Watch the video about Ruby Allmond’s life at the bottom of this page. 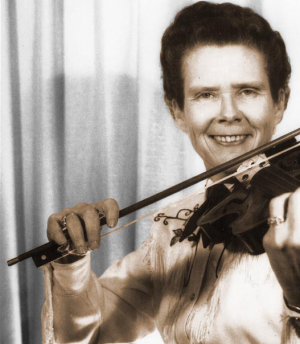 From then on, Ruby practiced daily on the fiddle. Soon she resolved to disprove the idea that “no woman could play the fiddle well.” After high school, Ruby farmed in partnership with her dad and worked on her fiddle playing, practicing as many as eight hours a day. Through many local performances in homes and schools, she developed her stage personality and created a unique style of play. Emphasizing harmonies and double notes, she made a rhythm with the fiddle bow. In the late 1940s and 50s, Ruby Allmond often traveled north to Durant and even as far west as Abilene to perform in shows. Two veteran fiddlers who regularly performed with her for a trio fiddle show were Georgia “Slim” Rutland and Howard “Howdy” Forrester. Greenville was their favorite venue, and there Allmond drew billing as the National Champion Woman Fiddler. Allmond then put together her own band, called “The Texas Jamboree,” which was advertised as a “Top-notch Fiddle Band.” In addition to her, it included Guy Bryant and his son and daughter, Gene and Joyce, on mandolin and acoustic guitars, plus Clay Harvey on stand-up bass. Congressman Sam Rayburn, Speaker of the U. S. House of Representatives, frequently carried them with him on the campaign trail as he ran for re-election in the 1950s. As TV began to provide popular entertainment and interest in the local music shows died out, Allmond began writing songs. Her close friend Audra Brock bought a good tape recorder and they taped the songs as Allmond composed and performed them. For the next thirty years, she concentrated on writing songs and earned royalties from a number of them. Congressman Sam Rayburn frequently took Ruby and her band on the campaign trail in the ‘50s. Allmond’s composition technique was unusual. She worked at Bonham State Bank, and during the day she would brainstorm imagery for a new song and begin composing words and music in her mind. After work, she came home to share the evening meal with her father and visit with him. Then she walked over to Brock’s house, where they had a small studio constructed. She would immediately pick up her guitar and begin to play and sing a new song. Brock recalls that Allmond always insisted on playing and singing the new piece through without interruption the first time. Allmond used a classical guitar so her voice could be heard clearly over the music. Although she might have the words jotted down, she never wrote the notes out on the music staff. By the time she finished revising, she had layered the new song with meaning, like a poem. In 1968, the two women decided to take some of the songs to Nashville. Before making the trip, they visited Cindy Walker, a noted songwriter who lived in Mexia. Recognizing Allmond’s talent, Walker gave her an introduction to Bob Jennings at RCA Music, and they sent him a tape. Taking a week of vacation from their jobs, Allmond and Brock drove to Nashville and met Jennings. He later said that when he first listened to the tape of Allmond performing her songs, “the hair stood up on the back of my neck.” He welcomed them to a studio for a demonstration recording session. By the time they left Nashville, six of Allmond’s songs were under contract. At the end of that year, she began receiving annual royalty payments. Chet Atkins took two of her songs, Ferlin Husky took another, and Dottie West made “Reno” a top-ten hit. Ruby and Audra began making trips to Nashville twice a year to keep their contacts fresh and meet more artists. They also enjoyed sitting in on recording sessions with such performers as Jimmy Dean, West, and Dolly Parton. Phase three of Allmond’s career dates from the 1980s when she decided it was time to create a legacy, in two forms. One part was accomplished by making frequent guest appearances at local country music shows. In this way, she encouraged young musicians and taught them how to perform on stage, just as others had done for her. Her personality and good humor made her a favorite of audiences. When she became too ill to perform, she and Brock spent many hours producing a book and a set of compact discs to preserve and showcase her music. Allmond chose the title: “Today I’ll Think about the Rain,” which comes from one of her songs. The book prints the lyrics to 41 of her songs, and on three accompanying compact discs, Allmond performs them. Although the project was not complete when Allmond’s death occurred in January 2006, Brock carried it through and set up a website that provides music samples, background information and photos. Currently she is negotiating with Texas A&M University at Commerce and Texas Music Center in Dallas to create a Ruby Allmond archive that will be available to musicians and scholars alike. Ruby Allmond at home working on a new tune. Photo courtesy Audra Brock Collection. No I mustn’t ever pass this way again. When Reno brought me to this land. And hoping that I’d understand. Much more than he’ll ever love me. To be tied to a wife and a child. And Reno, I’m goin’ back home. So peacefully plays on the floor. Has suddenly vanquished my pride. To be alone without a wife and a child. Oh, Reno, I’m coming back home. This article appeared in the Spring 2008 issue of Texoma Living! The video was a student project made a while ago. We would direct anyone interested to visit Ruby Allmond’s website for complete lyrics. What a beautiful tribute to Ruby Allmond! You made the video so neat…so pretty! It is such a good portrait of Ruby’s personality. The lyrics (in the video) of both songs were not accurate; would you like to correct them? It clears up the meaning of the songs to have them correct. Thank you for such a great tribute!